What's a VBS Super Leader? Super Leaders are kind of like super heroes! These committed volunteers are just regular people, who, at some point, had a VBS director match their skill set and willing heart with a VBS role especially suited for them. Here are some insights on how to match your Super Leaders with their gifts and strengths. Super Leaders come in all shapes and sizes—youth volunteers, parent volunteers, and group guides, just to name a few. Each person has her own special gifts that make her the right fit for some roles and not for others. So, as a VBS director, be sure to talk with your volunteers and ask them: What excites them? What drives them? Are they good with numbers or do they find joy crafting and creating? One area in which Super Leaders are especially heroic is crafts. These kind of folks are ready to roll up their sleeves and find creative ways to make VBS memorable. From glue sticks to glitter, they know that hands-on crafts help children understand Bible truths in fun, hands-on, memory-making ways. These Super Leaders love games. While energetic teens are ideal for this role, any Super Leader should be considered for this role if she has the energy. Teens are perfect for setting up the games, concept, and rules explanation, and even participate with the younger kids if there are other adults around to help supervise. Younger children enjoy seeing an older role model who is more than willing to have a blast with them! These Super Leaders are naturally the life of the party—and for the VBS Music Leader gig, it's all about helping kids worship that excites them the most. These people are not afraid of kids who move and groove and jump around. They're in charge of helping teach songs and actions in the most exciting way possible! Read 3 Tips for Teaching VBS Song Actions for some extra tips and tricks for this site. 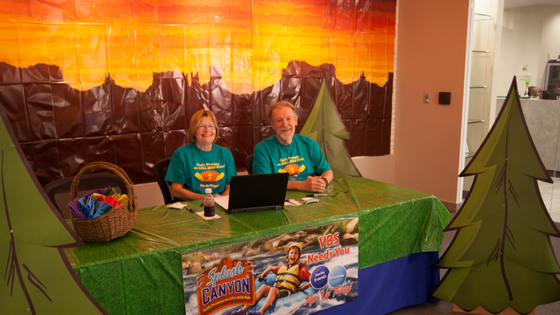 It may not be flashy, but your administrative people are vital to a well-run VBS. These ultra-organized Super Leaders are perfect for leading student registration, ensuring that everyone is checked in, noting any allergies or special concerns, and keeping parents and caregivers well-informed about what their kids can expect at VBS, explain the child pick-up procedure, ask for parental permission for photographs of their children, and provide information about their church. Some amazing Super Leaders love to be behind the scenes. They take joy in knowing that they've made someone's day a little better even without recognition. These leaders don't mind running extra errands, making phone calls, taking photographs, and just simply make sure children are focused and the other volunteers have everything they need. Take a look at our site leader volunteer training materials. They are packed with tips and hints tailored specifically for each different VBS site and skill set.